November is Bake Craft Sew DECORATE series month here on Classy Clutter! If you’re new or haven’t visited in a while, we will be having Christmas and Holiday decorating ideas around here for the whole month of November! We will be teaming up with our blogging friends Cindy, Mique, and Leigh Anne! We are excited about it so be sure to come back every day in November for another Holiday decorating idea! If you missed anything, you can check them out here. Hi friends! I’m Brandy from BD Design, where I blog about all of my favorite ideas from home decor to yummy recipes to party planning to simple DIY’s. Christmas is the holiday I look forward to most when it comes to decorating! 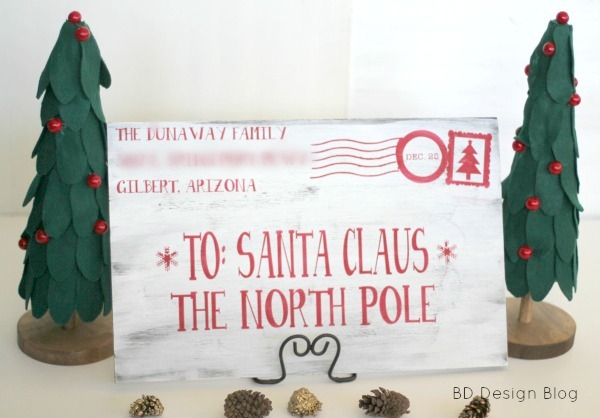 There are so many ways to incorporate the magical spirit of Christmas in your home but it usually comes with a high price tag. 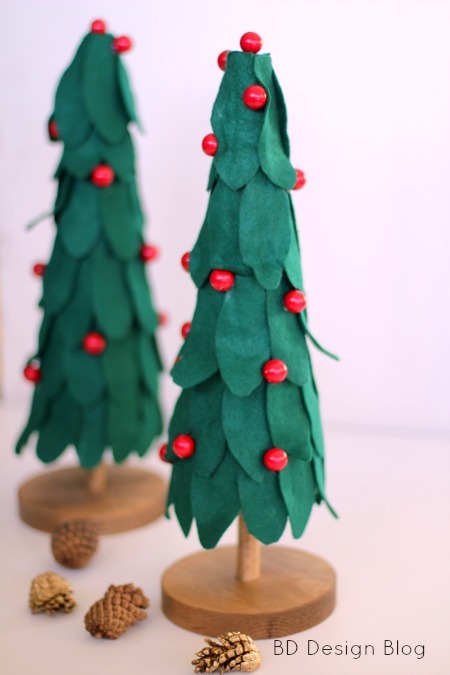 So when I made these DIY felt Christmas trees for under $10 I couldn’t wait to share them with you. 1. Stain your wood dowels and wood bases with a dark stain of your choice. Drill a hole in the center of the base for the dowel to fit inside of. I added a drop of hot glue in both the base and the cone to make everything more sturdy. 2. Next take your felt and cut A LOT of leaves. I think for these 2 trees I cut about 70 leaves. I used 4 sheets of felt. 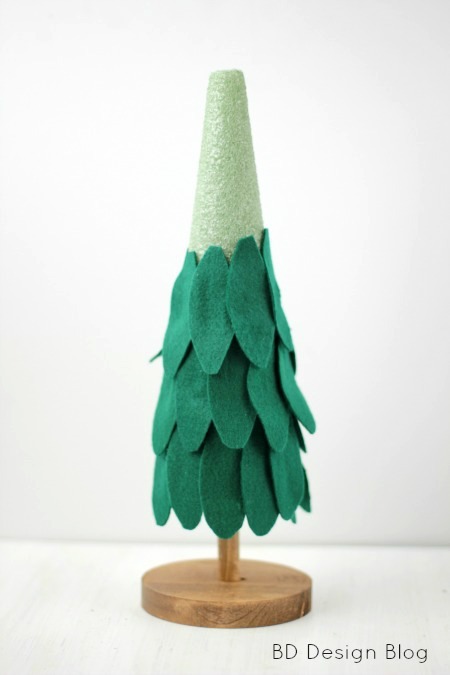 Starting from the bottom and working your way up, glue each leaf to the cone. 3. 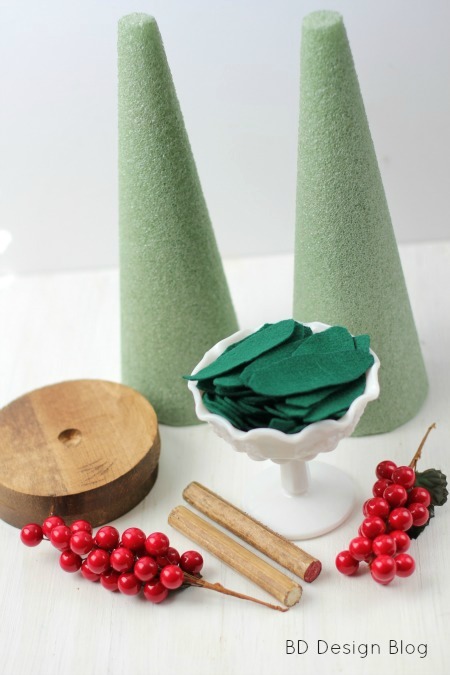 Take the bunch of berries and cut each berry of and hot glue them to the felt. That’s it! Super easy and cute, right? 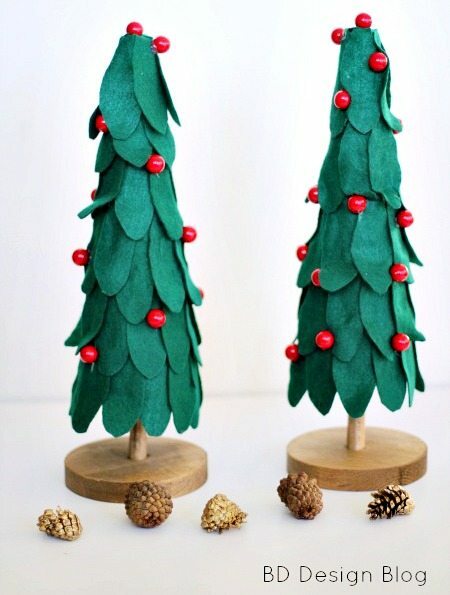 I can’t wait to display these darling trees this year next to my newest Christmas sign from my Etsy shop. 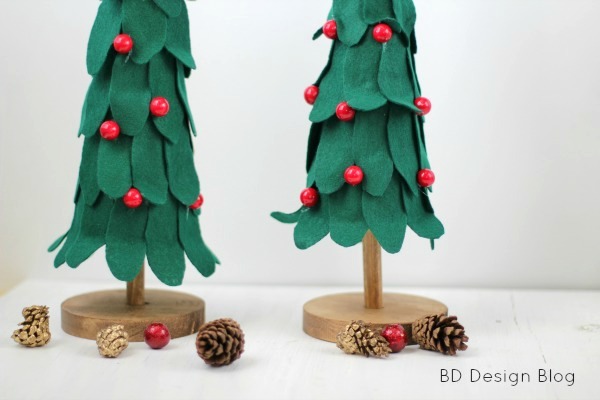 Be sure to check out BD Design for more Christmas inspiration! Thanks so much for sharing Brandy! These are so cute and would be so fun to make! Be sure and follow Brandy on her blog, BD Design and on Facebook, Instagram and Pinterest!